What Happened to Placeholders in Windows 10? 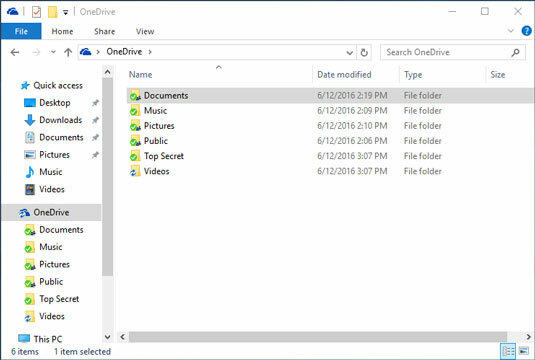 In Windows 8 and earlier, OneDrive was a moderately useful online storage system with plenty of shortcomings, but at least it integrated nicely into Windows. Windows 8.1 introduced a feature called placeholders that, like competitor Dropbox, gave you the impression that all your OneDrive files were stored on your machine, when in fact they had to be downloaded before you could use them. Although there were additional limitations, Win 8.1 OneDrive gave you all the advantages of cloud storage without swallowing enormous swaths of storage on your local hard drive. In Windows 10, you don’t have the Windows 8.1 form of OneDrive — there are no placeholders. 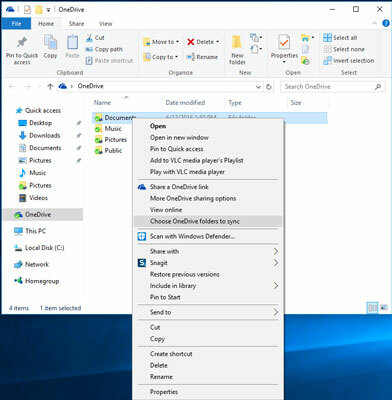 As you see at the beginning of this chapter, when you activate OneDrive on a computer, you have to choose which folders (or files) get synced. There are no placeholders, no tiny thumbnails of files to act as a stand-in and guide you through File Explorer. Either you have the file and you can see it, or you don’t have the file and OneDrive hides it from you in File Explorer. Lots of people now have many megabytes in OneDrive. Some (like me) have many gigabytes in OneDrive, and a few have terabytes in OneDrive. If you try to sync all that data onto a typical desktop hard drive, it may or may not survive the experience. But trying to sync all that onto a fast solid state-equipped laptop with a tiny drive is just a non-starter. Think of it this way. If you stuck all your photos in OneDrive, would you want to have copies of all those photos automatically synced up with your phone? The second big reason to avoid syncing all your files to all your devices is that even the tiny space occupied by a thumbnail can — if you have gazillions of files — completely overwhelm whatever computer you’re using. When people kept only 10,000 photos in OneDrive, they could still tolerate thumbnails of all those photos appearing on their tablets. But when the number of photos hits 100,000 — or a hundred times that many — the hardware just can’t handle it. Not to mention the bandwidth charges. Unfortunately, there’s a huge downside to getting rid of the files and the thumbnails: It’s entirely possible to have gobs of data in OneDrive and not even know through File Explorer that the data exists. You can crank up your web browser and see the ugly truth, but File Explorer remains oblivious. Microsoft’s stuck between a rock and a hard place. Even if they showed you thumbnails of all your files, there may come a time — get on a plane without a Wi-Fi connection, for example — when you think that you have a copy of the file handy, but you don’t. More than a few knowledgeable Windows 8.1 users got bitten that way, and they weren’t too happy about it. Many alternatives have been proposed by disappointed Windows 10 users, but Microsoft’s marching to its own tune. The bottom line: You’re going to see updates to how OneDrive behaves, over time, but you need to learn to live within the constraints of the version of OneDrive that you’re using at the moment. Or switch to Dropbox. Or Google Drive. Or iCloud. Or Box. Click the icon in the taskbar to start File Explorer. Navigate to your OneDrive folder, and right-click any file in the folder. You see the options shown here. Set up syncing from inside File Explorer. Select the Choose OneDrive Folders to Sync option. OneDrive responds with a dialog box that lets you choose which folders you want to sync. Select the boxes next to the folders that you want to have copied — and updated — on your computer. Note that there’s no way to sync a subfolder or an individual file. You can only sync folders at the highest level. Click OK. OneDrive starts syncing the contents of those folders — and only those folders — on your PC. The result of telling OneDrive to sync specific folders. Microsoft promises it’ll make the process easier and better.